The AB Moteurs channel, in its coverage of the Oschersleben FIA GT race today, revealed the names of the Vitaphone Racing third drivers for the Spa 24 hours. Michael Bartels / Andrea Bertolini will be joined by Eric van de Poele in the # 1 car and Jamie Davies / Thomas Biagi will be joined by Vincent Vosse in the # 2.
van de Poele was part of the winning crew last year, with Michael Bartels and Timo Scheider (below). Andrea Bertolini was on the podium too - as was Christophe Bouchut.. In other Maserati news, Yvan Lebon is talking to Jean-Michel Bouresche about entering enter a Maserati MC12 for the last round of the French GT Championship. 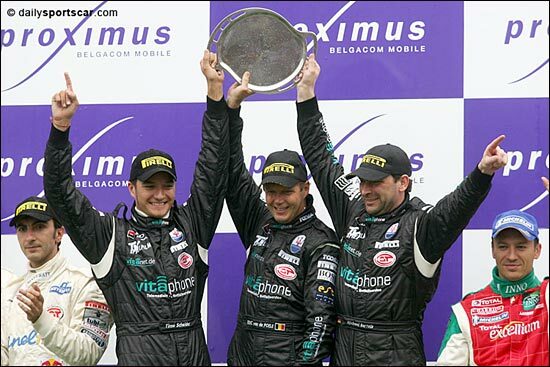 Yvan Lebon drives, with Christophe Bouchut, the second SRT Corvette C5-R in this championship, a car entered in FFSA-GT when there is no Belcar round the same weekend. The second SRT Corvette won't be entered at Magny-Cours in October and Yvan Lebon is looking for another car for this race. A third Saleen S7R could be entered in FFSA GT this season. Frédéric Hauchard, with the Tarrès Team, are rumoured to be working on this.